Comments: Evergreen broadleaf from Southeast Asia and India. Dark glossy green ovate leaves with small wing-like extensions to the stem, gray bark, creamy white flowers and orange colored fruit. Species brought to California in the 1770's by the Spanish Missionaries. 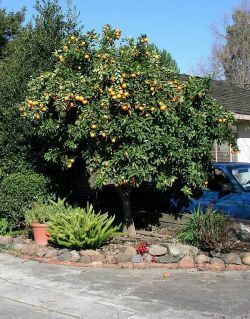 Numerous trees throughout Washington Township and one of the nation's premier citrus growers is located in Mission San Jose, but the area is too far north for commercial orange growing. 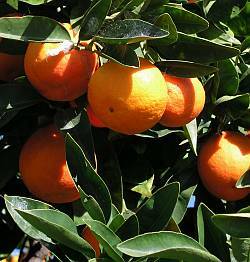 The orange is believed to be a cross between a pomelo (Citrus maxima) and a tangerine (C. reticulata).